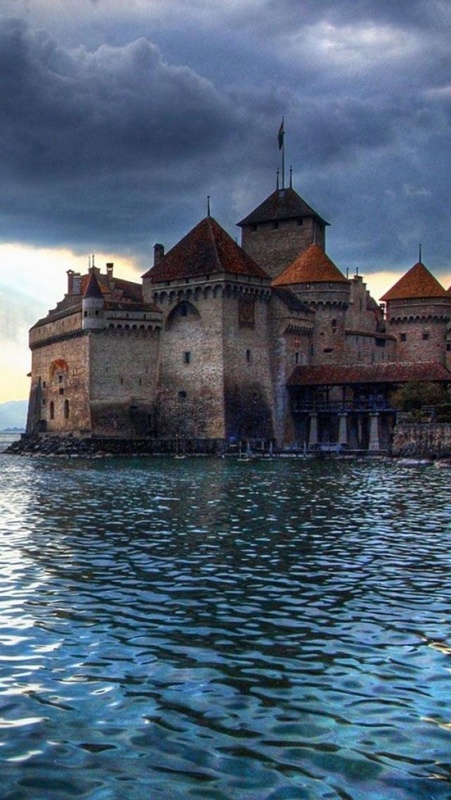 The Château de Chillon (Chillon Castle) is an island castle located on the shore of Lake Geneva in the commune of Veytaux, at the eastern end of the lake, 3 km from Montreux, Switzerland. The castle consists of 100 independent buildings that were gradually connected to become the building as it stands now. The oldest parts of the castle have not been definitively dated, but the first written record of the castle is in 1160 or 1005. From the mid 12th century, the castle was home to the Counts of Savoy, and it was greatly expanded in the 13th century by Pietro II. The Castle was never taken in a siege, but did change hands through treaties.